1) Which occupation did Nicolas Cage's father have? 2) Which was the actual name of the Ghost Rider character? 3) Which movie is this photo from? 4) Which actor hasn't appeared in any Nicolas Cage movies? 5) Which is the first movie Nicolas Cage appeared in? 6) Which was the main character's name in Wild at Heart? 7) In Drive Angry, John Milton rescues a waitress named Piper from which of the following? 9) Which is Nicolas Cage's real name? 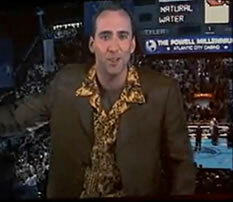 10) The name of the character Nocolas Cage played in National Treasure was? 11) In which movie does Cage co-star with Gary Sinise? 13) The Ghost Rider fights against the son of the devil himself named ______?